Avatar Bumper Cars Review Roundup! Following on from that mouthful of a title, greetings! Today I'm going to share a collection of all the reviews we've had so far. Enjoy! More will be posted as they're found! Some news - I've been working since the game was released on a patch to include online play in the game. Look out for this soon! We've reached the 5th day of Avatar Bumper Cars code giveaways. Today's the final "rearrange the code" competition. Here's today's code, and don't forget to let us know on twitter @TorturasFSG if you're the winner! Even though this is the final "rearrange the code" game, we are having 2 special (and much larger) code hunt games tomorrow and saturday for the final codes. Stay tuned on twitter for more info! Here is today's "rearrange the code" game. Let us know on twitter @TorturasFSG if you're the lucky redeemer! EDIT: Code redeemed! Check back tomorrow for the final "rearrange the code" game. Here is today's "rearrange the code" competition. I'll make it slightly easier than Sunday's version. Let us know on twitter @TorturasFSG if you're the winner! Enjoy! Avatar Bumper Cars sold 750 copies on it's first day. That was enough to send the game to the top downloaded game. Let's try and keep it there! Keep an eye out for more code giveaways today and the rest of the week! Avatar Bumper Cars Competition Time! 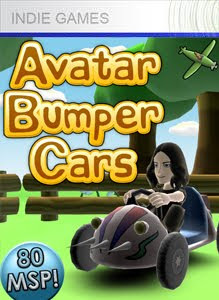 We're going to be giving away codes daily for the next few days for Avatar Bumper Cars. So here's the first code - it's split into separate parts though... first person to rearrange it into the right order wins! Code redeemed! - Follow @TorturasFSG for the next competition later today! Good luck, and let us know on twitter @TorturasFSG if you manage to win it! Flying Squirrel Games would like to announce that Avatar Bumper Cars has been released to the world on Xbox Live Indie Games. "Avatar Bumper Cars is a 1-4 player arena battle game. Watch your avatar take control of a bumper car in one of 5 different arenas and face off against either your friends or the computer in an action packed battle! Use your car's spikes to hit their gas cans and send them flying out of the arena. Will you be the last man standing?" You can download the game for the small sum of 80 Microsoft Points. Stay tuned to this website for competitions soon! For today's post I would like to share the news that Avatar Bumper Cars has "gone gold" as much as an Indie Game can. What this essentially means is that the game is finished, all the content is in, all the features are in, and all that's left is for the game to pass review. At the time of writing, the final build is in playtesting on the xna site - so if you're a member go and give it a shot. I will be uploading the final build for submission and review on Thursday (11th March). This means we expect the game to be releasing sometime in the following week or so - providing there are no massive bugs present. Stay tuned for more updates on this exciting release!